1809: born in Edo in the district of Asakusa. His father, Murata Ichihei, who was originally a low-ranking samurai in the province of Tôyama, is bantô in an inn. His mother, Otone, is a dance master of the Shigayama School. 1814: he becomes disciple of Nakamura Denkurô V.
11th lunar month of 1818: he makes his first appearance on stage, at the Nakamuraza, where he receives the name of Nakamura Tsuruzô I and plays in the drama "Ise Heiji Hiiki no Kamikaze". 1829 ~ 1837: Tsuruzô settles in Kamigata and becomes disciple of Nakamura Shikan II. Winter 1837~1838: Nakamura Shikan II, Tsuruzô and the actors Arashi San'emon IX, Nakamura Kan'emon, Nakamura Tsurugorô, Nakamura Komasuke, Nakamura Kaei and Asao Okuyama go together to Edo. 12th lunar month of 1849: Nakamura Utaemon IV, Nakamura Fukusuke I and Tsuruzô go back together to Ôsaka. 11th day of the 10th lunar month of 1851: his father-in-law Nakamura Kanzaburô XII dies. 15th day of the 2nd lunar month of 1852: his master Nakamura Utaemon IV dies in Ôsaka; Tsuruzô decides to go back to Edo. 3rd lunar month of 1853: premiere at the Nakamuraza of Segawa Jokô III's drama "Yowa Nasake Ukina no Yokogushi" (commonly called "Kirare Yosa"); Tsuruzô plays the role of Kômori Yasu [casting]. This performance is a huge success. 8th lunar month of 1861: premiere at the Moritaza of Kawatake Shinshichi II's drama "Sakura Sôshi Gonichi no Bundan", a revised version of Segawa Jokô III's drama "Higashiyama Sakura Sôshi"; Tsuruzô plays the roles of the boatman Jinbei, Maboroshi no Chôkichi and Yamana Sôzen [casting]. 10th lunar month of 1861: premiere at the Moritaza of Segawa Jokô III's drama "Zôho Futatsu Domoe"; Tsuruzô plays the role of Tatara Gyôbudayû [casting]. 8th lunar month of 1862: premiere at the Moritaza of Kawatake Shinshichi II's drama "Kanzen Chôaku Nozoki Garakuri"; Tsuruzô plays the role of Hayanori Sanji [casting]. 9th lunar month of 1865: Nakamura Tsuruzô I takes the name of Nakamura Nakazô III at the Nakamuraza, performing in the dances "Kadomatsu" [print], "Tsuri Gitsune", "Saruwaka" and "Shimbochi Taiko". 10th lunar month of 1865: Nakazô celebrates his shûmei at the Ichimuraza, playing the roles of Iwakura Saemon and Kuniyuki in the drama "Ashiya Dôman Ôuchi Kagami". His stage partners are Bandô Hikosaburô V, Bandô Mitsugorô VI, Ichikawa Danzô VI and Ichimura Kakitsu IV. 5th lunar month of 1866: tour in the province of Niigata. 10th lunar month of 1872: premiere at the Moritaza of Kawatake Shinshichi II's zangirimono "Tsuki no En Masu no Igaguri"; Nakazô plays the role of Tajimaya Tazaemon [casting]. June 1873: premiere at the Nakamuraza of Kawatake Shinshichi II's drama "Tsuyu Kosode Mukashi Hachijô" (commonly called "Kamiyui Shinza"); Nakazô plays the roles of Chôbê and Genshichi [casting]. 1875: Nakamura Kanzaburô XIII retires and entrusts the management of the Nakamuraza to Nakazô. October 1875: premiere at the Nakamuraza and the Shinboriza of Takeshiba Kinsaku I's drama "Minori no Aki Seishô Denki"; Nakazô plays the role of Katagiri Miki-no-Kami [more details]. 31 December 1876: a fire breaks out in Edo in Asakusa, which destroys the Nakamuraza. Spring 1877: tour in Kôfu (Mitsuiza) and Nagoya (Tachibanaza) in the company of the stars Ichikawa Danjûrô IX and Iwai Hanshirô VIII. October 1878: premiere at the Shintomiza of Kawatake Shinshichi II's drama "Jitsugetsusei Kyôwa Seidan"; Nakazô plays the roles of Naniwaya Sôemon and Ômu no Ryûzô (later the priest Ryûzen) [casting]. February 1879: premiere at the Shintomiza of Kawatake Shinshichi II's drama "Ningen Banji Kane no Yo no Naka"; Nakazô played the role of Henmi Seizaemon [casting]. 16 July 1879: Nakazô takes part in the gala night at the Shintomiza in the honor of the General Ulysses S. Grant [more details]. January 1883: premiere at the Shintomiza of Kawatake Mokuami's drama "Medeshi Yanagi Midori no Matsumae"; Nakazô plays the role of Ôkubo Hikozaemon [casting]. June 1886: Nakazô appears on stage for the last time, at the Nakamuraza. Then, he difinitively retires. Nakamura Nakazô III was an outstanding supporting actor, excelling in katakiyaku and fukeyaku roles. He was also an excellent dancer. 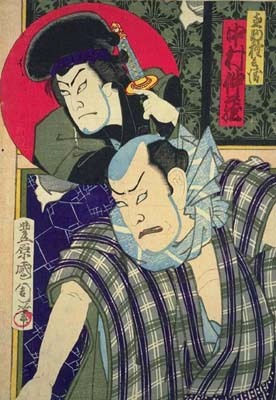 He transmitted his amazing knowledge of Kabuki to the rising stars Onoe Kikugorô V and Ichikawa Danjûrô IX. His most notable role was Kômori Yasu in Segawa Jokô III's drama "Yowa Nasake Ukina no Yokogushi".